Every year I look forward to Christmas and every year I become overwhelmed by the number of preparations involved, so naturally I was happy to see this card, painted by my grand-daughter, Rachel, who is 10. I love the simplicity of the tree and the bright colors. 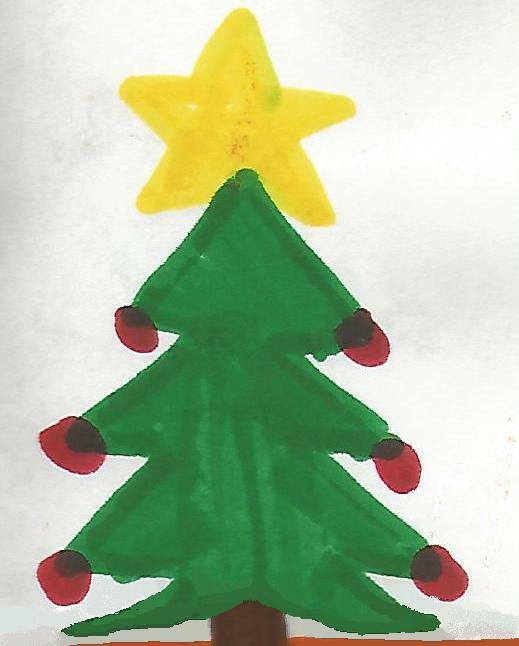 If only decorating the tree was as easy as this simple painting. The first thing I do is assemble my large imitation tree. I help my husband as he places the color-coded branches in their respective spaces on the pole, which eventually becomes an evergreen-shaped plastic object. Once the branches are in place, I go around the tree spreading out the small boughs like lettuce leaves, so they are available to hang ornaments. “No,” I answer, “Then I’ll just have to change them.” What? Can’t I accept help with this humdrum job? No, because I am OCD. (Doctors say this means Obsessive-Compulsive Disorder, but I say it means Overly Concerned Dunce). I can’t accept help because I need to have all the lights spaced evenly around the tree with no two lights of the same color next to each other. No one else seems to have the patience or concern to do that. And if they do, they always make a mistake and I have to do it over. And if you are a mental health practitioner, yes I am in therapy! Unfortunately, I am that way with the ornaments too, so the next day I drag out the old foot-locker that has held our Christmas decorations for the last 20 years. It is always fun to open it, because years ago I glued a giant picture of Santa’s face on the inside, and he greets me with a big smile. I can’t help it. I always smile back and giggle. I begin routing around for ornaments, pulling out the larger glass balls first, then the medium and small. I put them on the tree carefully, according to color, spacing and size until I am satisfied that it looks perfect. Then I add the special ones, including angels of different sizes, a snowman, a glass elephant and a Madonna and child ornament. At last the tree is beginning to look done. I fall exhausted onto the sofa, while my husband tries to revive me, patting me softly and saying “it looks beautiful.” But I don’t hear him, I’m asleep. I don’t have OCD and some years I still think I do it better by myself,lol. Tell me, if you have a certain system, does the tree turn out the same every year? No. Oddly enough its always different. I have another way to decorate when I use the miniature white lights. Does everyone want to do it themselves? haha, well if you care what the outcome is. Most years I did care but other times the kids took over. Still had to pass my inspection, though. It’s my decorating gene, I swear! Kids are grown now and have their own opinions of what looks right. So, yes and no….that didn’t really answer, did it? I agree you must have the decorating gene, and I didn’t expect you to know if everyone wants to do it themselves.